There have been a few inquiries from readers asking me where to get feathers and fluffy boa or artificial fur for craft projects. I’ve managed to locate on shop in Petaling Jaya that sells these items. 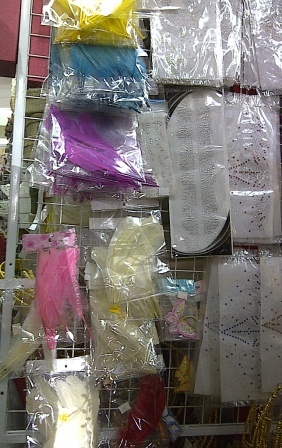 The coloured feathers in yellow, blue, purple, pink and white as seen below are sold in smaller quantities. In each packet there are about 6 pcs of feathers- I forgotten the pricing- but if not mistaken it is about RM4.90, RM5.90 or RM6.90 per pack. 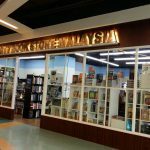 It is not cheap- a reader said in Macy in Kuala Lumpur it is sold in bulk and therefore more expensive but I am not sure of the pricing. Above are some fluffy boa and the ones used to make hair ribbons. 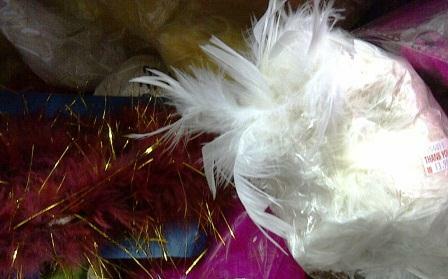 The packet in white for the fluffy white boa are sold at RM13.90 per packet. Name: Carrots Florist and Handicraft.